Odd Jobs Done Right – Outdoor Services prides itself on giving the best quality and workmanship in outdoor services to commercial and residential clients alike. Odd Jobs owner Bob Whituhn came to Appletree with a deep seated desire to improve his website and grow his business online. Bob’s website had been built using a “build-your-own” website program. He feared his old website would be sign of the service he delivered, he wanted a website that shared his motto of quality and workmanship. 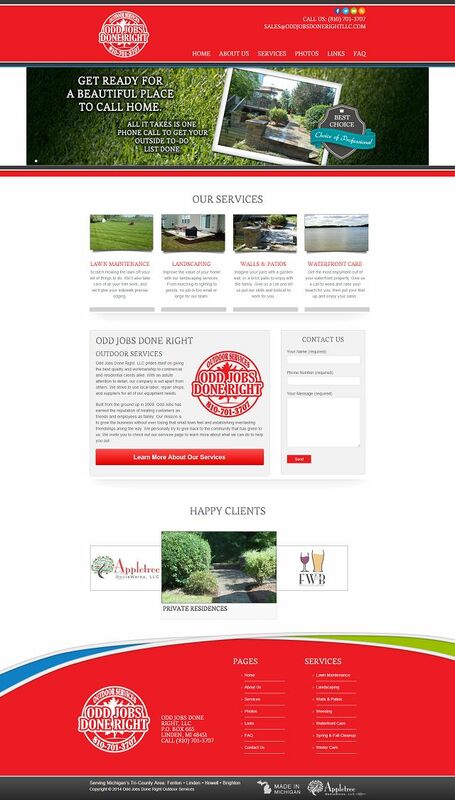 Appletree created a complete website redesign for Odd Jobs that showcased real client photos. The web design concepts were bright, fun, clean, and cheerful just like Odd Job’s crew members. A custom WordPress integration included many WordPress plugins that helped meet the client’s need for search engine optimization, website interactivity and social media integration to build their business sales marketing. The client had zero experience with using WordPress to perform website maintenance. Appletree provided a hands on two hour client training session to teach the owner to maintain and update his new WordPress website. The training also included lessons on using Facebook and Twitter to grow his social media audience. Within a few days the client had taken over maintenance of his own website and social media.